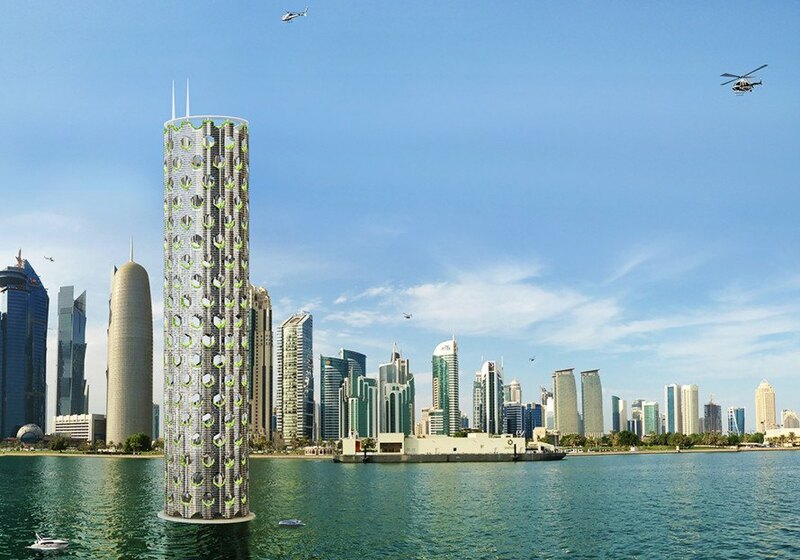 Italian design studio Luca Curci Architects unveiled their proposal for a floating vertical city for 25,000 inhabitants. The 180-storey tower would have a modular structure that would bring natural ventilation and light into the living units. 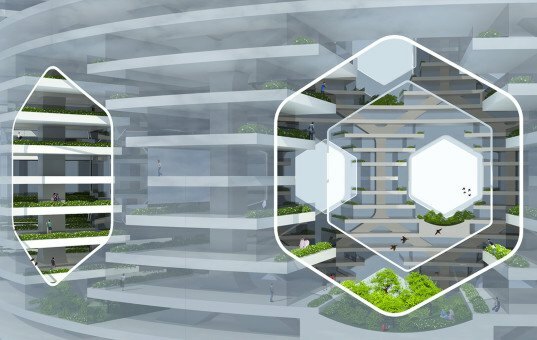 Aiming to provide an alternative design for a population interested in healthy lifestyles, the architects envisioned the city-building with public gardens along its entire height. The building would be anchored to the sea floor and have underwater parking areas, technical facilities, spas, meditation centers, gyms and luxury hotel rooms with underwater views. It would be accessible via a semi-submerged bridge for pedestrians, cars and public electric transport, which would connect the land with the basement levels. A heliport is located near the upper garden-square and vertical linking installations. The tower is made up of 10 modules, each with 18 floors and 58,000 square meters of floor surface, housing homes and services, offices, stores and other facilities. The tower can support a community of up to 25,000 people. Different-sized residential units include apartments, duplexes and villas. The outside surface, with green areas and gardens, comprises 20,000 square meters. Ten overlapping modular layers provide the structural and organizational basis for the entire building. Based on a modular 3d network, the structure is enveloped with a membrane of photovoltaic glass, which provides electricity to the whole building and makes it energy-independent, providing further energy for buildings on the mainland too.